The Indian Army is one of the oldest institution and part of the Indian Armed Forces . The Indian Army has glorious past which is full of bravery , valour and saga of rich traditions. The History of Indian army can be broadly studied in two parts . Indian Army : Pre-independence History. Indian Army : Post-independence History. 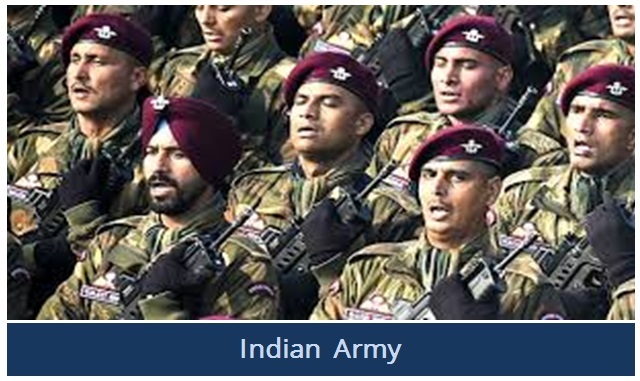 The Indian Army is the largest component of the India’s Armed Forces which mainly consist of land based personnel . The Indian army was established on 1st April 1895 during British rule in India. The Indian Army inherits its past and originated from the armies of the British East India Company. This unit, later on, is known as the British Indian Army, and also includes the armies of the Indian Princely States. After India’s independence in 1947 from Britain, the “British Indian Army” was decommissioned and this army unit finally became the Indian National Army. The different units and regiments of the Indian Army in both pre and post independence , have diverse histories and participated in a number of battles and campaigns across the world . The Indian army has actively participated in many wars in the past and earned a large number of battle and theatre honors in both the pre and post-independence period. India got independence from Britain on 15th August 1947. India’s independence also witnessed the partition on India on religious ground and bulk of the Muslim population separated from India which gave birth to the state of Pakistan as an independent country. The partition of India just after independence also resulted in the partition of Indian Armed Forces. The end of British rule in India also witnessed the end of the existing British Indian Army and its administration. Field Marshal Sir Claude Auchinleck oversaw the division of the British Indian army forces. Around 260,000 personnel mainly Hindus and Sikhs joined the Indian armed force And 140,000 men, mainly Muslims became the part of newly formed Pakistan Armed forces . The Indian Army was an important part of the British Empire‘s armed forces, both in India and abroad . 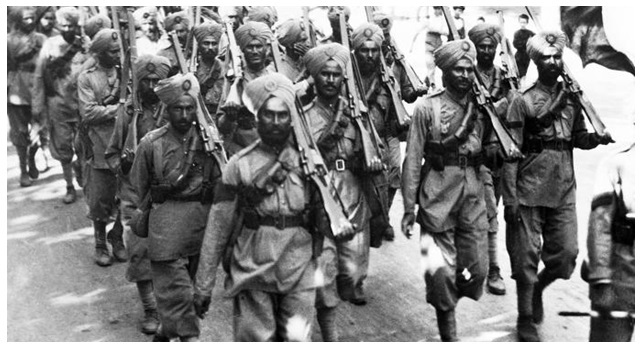 The “British Indian Army” was deployed and actively participated in both during the First World War and the Second World War. The First world war ( WW1 ) started on July 1914 to Nov 1918 in Europe. Britain’s involvement in this war also dragged the British Indian Army and two battalions of the British Indian Army were deployed and participated in this war on behalf of British Empire . The First world war ( WW1 ) was between the two warring groups that allied forces ( France , British Empire , Russia , America ) and central powers ( Germany , Austria , Hungary , Bulgaria ) . The second world war ( WW2 ) started in 1939 Europe and lasted till 1945 . The British Empire was fighting against Germany and Japan . The British Indian Army was again deployed and actively involved in action in WW2. The Second world war ( WW1 ) was between the two warring groups that includes allies ( France , British Empire , Russia , America ) and Axis ( Germany , Japan , Italy ) . The allies won the war with defeat of Germany and use of nuclear weapons against Japan by United States of America . The Army extensively participated in this war fighting as part of British Empire . About 87,000 Indian soldiers lost their lives during this conflict for fighting against Japan , Italy and German forces. The Indian soldiers were awarded 30 Victoria Crosses during the Second World War for their velour. After India’s independence in 1947, the British Indian army was decommissioned. Due to the partition of India into India and Pakistan, this force was further split to join the India and Pakistan armed forces . The Hindus , Sikhs and other became part of Indian Army and the Muslim group joined the newly formed Pakistan army. The Indian Army is the land-based branch and the largest component of the Indian Armed Forces. The Army enjoys the reputation of one of the largest, most professionally trained and well-equipped armies in the world. The President of India is the Supreme Commander of the Indian Armed Forces. The Indian army is commanded by the Chief of Army Staff ( COAS ) , who is a four-star general. So far only two Indian army officers have been conferred with the honorary rank of field marshal , which is a five-star rank. The Field Marshal rank is a ceremonial position of highest great honour. The Indian Army is the most vital component of the Indian armed forces with the primary mission to ensure the national security and national unity of India .The Indian Army is also responsible for defending the Indian nation from external aggression and internal threats and maintaining the territorial integrity of its borders . The army is also sometimes assigned the role to ensure peace and security within its borders. The Indian army has also played a commendable role in event of natural calamities by helping civilian forces in conducting humanitarian rescue operations during natural calamities and other disturbances. After India’s independence in 1947 , India found itself stranded between aggressive China and belligerent Pakistan . The British legacy of unresolved border dispute with China and Pakistani aggression to capture the Kashmir from India. The Kargil war is referred to the forth armed conflict between India and Pakistan in 1999. The Kargil war was planned and executed by then Pakistani Army Chief General Pervez Musharraf. It is believed that General Pervez Musharraf had initiated this operation without any consultation and prior approval from the civilian government in power led by then-Prime Minister of India, Nawaz Sharif. The Kargil started during early 1999, when Pakistani troops infiltrated into the Indian territory by crossing the existing Line of Control ( LOC ) and occupied Indian territory along the hilly terrain in the Kargil district. The Indian government responded by launching a major military and diplomatic offensive against Pakistani infiltration. The Pakistani infiltrators along with Pakistani army soldiers had occupied many strategic locations in the hilly terrain of Kargil district. The Indian army responded by mobilizing its forces and launching a massive attack to recapture these positions and to evict these infiltrators . The international community also played a crucial role in mounting a pressure on aggressor Pakistan to revert back to the LOC positions. The military conflict between the two nuclear-powered countries could have escalated to full-scale war . The Pakistani government faced an embarrassing situation and complete diplomatic isolation. The Indian army despite the lack of positional advantage in this hilly terrain of Kargil had started a massive counterattack against Pakistani Positions. The Pakistani infiltrators could not sustain the Indian army offensive and started losing the positions occupied one after another along the mountain peaks. The Indian army had slowly recaptured most of the ridges that were encroached by the Pakistani infiltrators by inflicting heavy casualties. The Indian Airforce also provided the necessary support by mounting the attack on Pakistani occupied positions with laser-guided bombs using French Mirage 2000 fighters . The Indian Air Force fighters equipped with long-range BVR missiles kept the Pakistani fighters away. Eventually, the Pakistan army once again faced a humiliating defeat and vacated all the positions occupied. It is estimated that Pakistani side suffered around 4000 causalities and even refused to accept the bodies of its soldiers . The Indian side suffered 460 casualties. The Indian Government celebrates Vijay Diwas in the memory of victory in the 1999 Kargil war against Pakistan . The Indian government was initially taken aback and had not expected any such misadventure by the Pakistani army . Just few months back , Then Prime Minister Of India Atal Bihari Bajpai had travelled to Pakistan to initiate a peace talk and kirgil conflict started by Pakistan completely ruined the peace process between the two nuclear-powered countries. The Indian Army is the 2nd largest standing army in the world . The total army personnel strength with 1,237,117 active troops and 960,000 reserve troops. The army is continuously evolving and also undergoing through the process of modernization . This modernization program embarked on infantry is known as Futuristic Infantry Soldier As a System ( F-INSAS ) . As a part of this program , various units of the army are being equipped with latest weapons , platforms for its armoured vehicles such as MBT tanks , ICV combat vehicles , towed and self-propelled artillery guns, and armed helicopters for aviation branches. The Indian Army has a regimental system but is operationally and geographically divided into seven commands, with the basic field formation being a division. It is an all-volunteer force and comprises more than 80% of the country’s active defence personnel. The main battle tank ( MBT ) is the primary weapon system of the any army and Indian army operates both Russian origin tanks as well as indigenous tanks . The Russian origin tanks currently operational include T-72 Ajay , T-90 Bhishma and indigenous tank include Arjun MBT ( Main battle Tank ) . The Indian army’s Regiment of Artillery was raised on 15 January 1935 . This artillery regiment is well equipped with a mix of various artillery guns 130 to 155 mm calibre guns. This regiment has played a crucial role in all the wars . 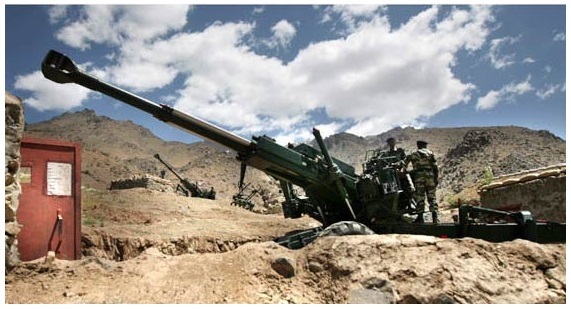 The Famous Bofors 155 mm gun was extensively used by the Indian army during the 1999 Kargil war with Pakistan . The Bofors guns , during this war, pounded the Pakistani positions on mountain peaks. The army has recently acquired the famous lightweight 152 calibre American M777 howitzers to strengthen its operations along the China borders . The army has also received the first batch of K9 Thunder is a South Korean self-propelled 155 mm howitzer. These K9 Thunder howitzers are developed by Samsung Techwin for the Republic of Korea Armed Forces and now manufactured by Hanwha Land Systems. These guns are now being manufactured in India under Make In India initiative by Indian private sector company L&T with technical collaboration and technology transfer. Do let me know what you what you think about Indian Army.